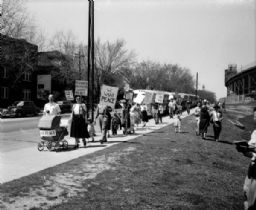 A peace demonstration was present on Breese Terrace, Regent Street, Little Street and Monroe Street as President Truman arrived for a speech at the Field House on Sunday afternoon. It was composed of a group of unidentified men, women and children carrying signs with war protest messages. ROTC members who were present said the protesters had attended an ROTC program recently. The marchers were unwilling to give their names to the police.